This paper describes preparation of zinc oxide (ZnO) based nanofluids in polymer matrix. The rheological properties of nanofluid were studied and were applied in heat transfer application. Heat transfer application of aqueous based ZnO nanofluid was tested and it was observed that, the presence of ZnO nanofluid effectively reduces the temperature propagation in a sono-chemically heated system. It is observed that the heat absorption capacity was increased by about 30-40% for the ZnO containing nanofluid. For the preparation of nanofluids, as synthesized ZnO nanoparticles were utilized after characterization by various modern tools such as UV-visible, Raman spectroscopy, XRD, SEM, Particle size analysis, and TGA studies. The average particle size of as prepared ZnO nanoparticle was in the range of 19 to 30 nm and XRD analysis revealed hexagonal crystal structure. Nanofluids (NFs) are new class of fluids comprising of base fluid i.e. water, ethylene-glycols, oils, bio-fluids, polymer solutions or other common fluids with nanoparticles (1-100 nm) suspended in them [1-3]. Nanofluids have the potential to enhance the heat transfer capability of conventional liquids both in terms of conductivity and continuity. Choi et.al were the first to introduce the concept of nanofluids to obtain better thermal characteristics that include thermal conductivity for heat transfer application [4-6]. They studied nanofluids and compared its thermal properties with suspensions containing nanoparticles. Among all the nanoparticles used in the nanofluid, metal oxides, carbides or carbon nanotubes are most common . Nanofluids have novel properties that make them potentially useful in many applications such as heat transfer , engine cooling and vehicle thermal management  electronic devices  nuclear system , space , heat exchanger , electronics cooling system , fuel cell [15,16], solar collectors , domestic refrigerator . Many researchers investigated the heat transfer characteristics of nanofluids experimentally  as well as theoretically [20-22]. Based on the literature, it is understood that the heat transfer efficiency can be increased up to 30% by applying nanofluid  Heyhata et al. worked on laminar flow convective heat transfer characteristics of alumina-water nanofluid in fully developed flow regime. They reported that the heat transfer coefficient of the nanofluid was higher by 32% for a specific study than the water, which also increased with increasing the Reynolds number and particle concentrations. Pak et al. studied heat transfer behaviour of Al2O3 and TiO2 nanofluid up to 4% volume concentration where they reported that at fixed Reynolds numbers heat transfer coefficient increases with increase of nanoparticles concentration. Williams et al. studied nanofluid with varied concentration of Al2O3 nanoparticles and observed that the heat transfer rate enhanced with increasing nanoparticles concentration. Duangthongsuk et al. studied TiO2/water heat transfer characteristics in the range of 0.2% to 2% volume concentration of nanoparticles. They observed that heat transfer grows by increasing nanoparticles fraction up to 1% volume concentration. For higher concentrations, however, heat transfer coefficient growth stops and starts to decrease. There are parameters other than nanoparticle concentration which affect thermo physical properties and hence heat transfer performance of nanofluids. For example, increasing zeta potential value of fluid minimizes particle-particle interaction and then decreases viscosity and thermal conductivity of suspension . Indeed, agglomeration and clustering of nanoparticles should be taken into account to avoid undesirable results. Similarly, several researchers have applied zinc oxide based nanofluid in their study where it has been reported that ZnO based nanofluid showed higher thermal properties than pure water. For instance, Haghshenasfard et al. studied ZnO/water nanofluid heat transfer in concentric tube and plate heat exchangers and obtained 14% and 20% increase of heat transfer coefficient compared to base fluid. In another study, thermal conductivity of an ethylene glycol/ZnO nanofluid was investigated by Lee et al. where they proposed a one-step physical method that enhances the nanofluids thermal conductivity more than the value predicted theoretically. It is also reported in the literature that nanofluids may always not enhance the heat transfer coefficient. Indeed it has been observed that some nanofluid formulation show less heat transfer even with higher concentration of the nanoparticles. Despite impressive literature on oxide based nanofluids, it is gathered that ZnO based nanofluids formulations are not in plenty. It is therefore imperative to conduct study on less explored oxide material which similar to other oxides e.g. TiO2. The present work demonstrates the heat transfer application of as-prepared ZnO based nanofluid tested against various solvent compositions during sonication process. It is well known that long duration of sonication process generates considerable heat and thus, sonicator was used as a source of heat for normal water containing vessel surround by a bath which contains the formulated nanofluids based on ZnO nanoparticles. Various common solvents such as water, ethanol, Toluene and Hexane were tested with and without the bath of ZnO nanofluid. We observed that the presence of ZnO nanofluid bath effectively reduced the temperature propagation in a sonochemically heated system. All chemicals were purchased commercially and were used as received. Zinc Nitrate hexahydrate, Zn(NO3)2, 6H2O (99%) was purchased from Thomas Baker, India. Starch and Polyvinylpyrrolidone, PVP (M.W 40,000) was purchased from Loba chemicals, India. The UV-visible spectroscopy was measured on Specord spectrophotometer. X-ray diffractions patterns were measured by using Cu-Kα (λ=1.5406 Å) radiation having tube voltage with 40mA current on Mini Flex Rigaku X-ray diffractrometer. SEM images and elemental analysis recorded (EDX) on Carl Zeiss Scanning electron microscope. TEM images were recorded using TECHAI G2 300 kV of (FEI, USA). Particle size distribution (DLS) was measured in DMF solution in the range of 0-100 nm using Sympatech (France) particle size analyzer at a Laser wavelength of 632 nm. In the present method, the synthesis was performed in de-ionised water by preparing the alkali solution of zinc nitrate by dissolving 0.5M zinc nitrate [Zn(NO3)2.6H2O] and 1M NaOH, in 100 ml water. The solution was continuously stirred and heated at 75 oC maintaining the pH 12. Polyvinylpyrrolidone (PVP, 0.2 gm) and starch (0.5w%) was added to create a capping on the surface of the precursor and the reaction mixture was kept for 5-6 hrs. at 75 oC to obtain white suspension. The particles were separated from the supernatant dispersion by sedimentation followed by centrifugation. The particles were then collected by centrifugation at 5000 rpm for 15-30 min washed several times with distilled water and ethanol. The white precipitate obtained was dried at 80 oC for several hours in a muffle furnace for ensuring the complete conversion of Zn(OH)2 to ZnO nanoparticles. The reaction equation for formation of ZnO is as follows. In the Nanofluid preparation, the ZnO nanoparticles were re-dispersed with respect to the base fluid EG/H2O to make up the volume concentrations 0.1, 0.5, and 1wt %. Also, 5wt % PVP or 1wt % PVA was added in to mixture to make the suspension more stable. Then, the solution was stirred on a magnetic stirrer before subjecting to ultra-sonication process (digital ultrasonic cleaner series LMU-6) to ensure re-dispersion of nanoparticles in the based fluids. The composition of the nanoparticles and suspension of the nanoparticles in the base fluids are shown in table 1. The rheological characterization of nanofluid was then performed using a controlled rate digital rheometer (Contrives LS 40) (Table 1). UV-visible Spectroscopy was employed to understand optical properties of as-formed zinc oxide nanoparticles. 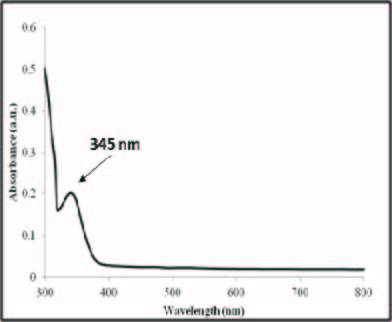 The UV-Vis spectrum of ZnO nanoparticles prepared with 0.5wt% concentration of soluble starch is shown in Figure 1. The absorption peak of the as-prepared ZnO nanoparticles was observed at 345 nm which was blue shifted with respect to the bulk ZnO and the absorption value showed an increased band gap of ZnO nanoparticles from bulk band-gap of 3.37 eV to 3.6 eV. Such enhanced band-gap properties can provide useful behaviour in presence of sun-light [30-32]. ZnO based nanofluid if used in a glass system will get reasonable understanding from the absorption properties after exposure to sunlight during the study (Figure 1). D= 0.9 λ/ β cosθ. Where, D - crystallite size, λ- wavelength (1.54 Å), β - full width at half of maxima and θ - diffraction angle. The crystallite size calculated from Debye-Scherrer equation was estimated to be between 15-20 nm. The crystallite size calculated by XRD was correlated with Dynamic light scattering particle size analyser. The particle size of the ZnO powder was measured by re-dispersing a small amount of as-synthesized ZnO nanoparticles in distilled water. The measurements showed (Figure 2b) shows the VMD (volume mass distribution) was 14.10 nm and SMD (surface mass distribution) was 9.54 nm (Figure 2a and b). TEM and SEM images of ZnO nanoparticles were obtained to study the morphology and approximate size of the particles. Figure 3 shows the spherical morphology of the ZnO nanoparticles. Careful examination of the individually formed of ZnO nanoparticle indicates that the diameters of the particles vary from 15-30 nm as per SEM and indeed this was much accurately observed by TEM where particle size was estimated to be about 15-25 nm (Figure 3a and b). It is clear that PVP capped ZnO nanoparticles are agglomerated. However, these aggregates are loosened or they break and disperse freely when sonicated in solvents such as water or ethanol. From Rheological studies one can understand about the shear thinning and thickening properties due to decreases or increase in viscosity causing shear stress. On the testing of nanofluid sample in the preset study, nanofluid at the volume concentration of 0.1w%, 0.5w%, 1w% with two different binding agents (PVA and PVP) were tested. Composition of nanofluid is given in Table 1. The rheology of various ZnO Nanofluids was measured and the correlation is shown in figure 4c (Figure 4). The graph shows decreasing viscosity with increase in the shear rate. This therefore hints towards their pseudoplastic nature due to shear thinning behaviour. At a certain shear rate, the nanofluid at 1wt% have the highest viscosity while the viscosity value is the lowest in the 0.1wt% nanofluid. So, in the present study nanofluid have behaved as non-Newtonian fluids . Viscosity of the nanofluid gradually increases with increase in ZnO concentration. The relative viscosity increases up to about 60% in comparison of to the base fluid as the volume concentrations of nanoparticles increases to 1vol%. Contact angle is one of the important characterizations to measure the wettability and nature of the fluids. The smaller the contact angles (less than 900) more the hydrophilic character. More hydrophilic nature is caused because of the weakening of cohesive forces. The larger contact angle value (greater than 900) shows the hydrophobic nature. In the present case, the Contact angle of the entire ZnO based nanofluid sample is found to be less than 900 (Figure 5) which means that they are all hydrophilic in nature. Indeed, the same is expected as the surface capping around ZnO is that of polymers that disperses well in water. 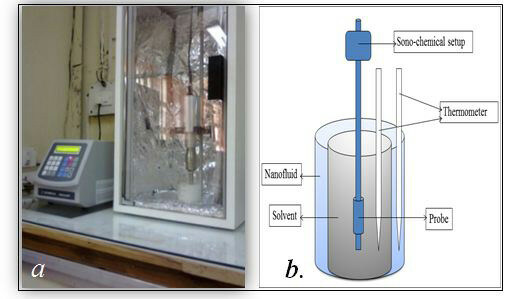 The experimental testing of ZnO based nanofluid for the application of heat transfer/absorption was conducted for sonochemically thermolyzed liquid composition e.g. water, EG and aromatic liquids. Sonicator was used as a source of heating whereby during sonication process heat is generated in the solvent system. The experimental setup is shown in Figure 6 which includes a sonicator, two thermometers, two bath tubs (one is smaller than other) and AC power supply (Figure 6). Thermometers were used to measure the temperatures of both the solvent and the bath. Before the experiment, total six sample P1, P2, P3, P4, P5 and P6 with the variation of 0.1wt%, 0.5wt%, and 1wt% were prepared with two different binding agents (PVA and PVP). In the samples P1, P2, P3, 5 wt. % PVP as a surfactant and for P4, P5, P6, 1wt% PVA as a surfactant was used. In the present testing method, a typical solvent was taken in a small beaker and labelled as 'A' the solvents used for testing were water, ethanol, toluene and hexane. The ZnO based nanofluids were taken in the bath tub and the beaker containing solvent was placed in the nanofluid bath. The probe of the sonication instrument was dipped in the solvent and the solvent was continuously sonicated for 5 min. immediately, after sonication the temperatures of both the solvent (TB oC) and the nanofluids in the bath (TC oC) was measured to observe the heat transfer/absorbing capacity of the nanofluids. All the experimental data in the graphical form is shown in Figure 7. Interestingly, we observed that when the solvent was sonicated in the absence of the nanofluids bath, the temperature of the solvent was much higher as compared to the temperature when nanofluids bath was used (Figure 7). Typically, the temperature (TA oC) of water, ethanol, toluene and hexane was 81, 70, 90 and 60 oC respectively when sonicated alone without the presence of nanofluids bath. The temperature of nanofluids when sonicated for 5 min in absence of any supporting bath fluid was 66 oC which is considerably lower than its base solvent which is water (81 oC). Thus, when the nanofluids bath was employed the temperature of the solvent (TB oC) decreased significantly and almost equalled the temperature of the nanofluids bath (TC oC). It was also observed that increase in ZnO wt.% leads to better heat transfer and absorbing properties as the temperature TB oC and TC oC were slightly decreased as the concentration of ZnO nanoparticles was increased from 0.1 w% to 1 w%. It was obvious that the thermal coefficient enhancement in nanofluids resulted in such heat transfer and absorbing properties. Zinc oxide was synthesized by chemical precipitation method from zinc nitrate and soluble starch using sodium hydroxide at pH 8. The UV-visible spectroscopy revealed that the ZnO nanoparticles show good optical properties with absorption wavelength at 345 nm with enhanced band gap energy which is related to behaviour of ZnO nano-particle under the photolight. The particle size analysis by DLS technique showed a narrow particle size distribution of 20-30 nm which correlated well with the crystallite size calculated from Scherer's equation following the FWHM value obtained from the XRD pattern. ZnO nanoparticle based nanofluids were prepared by two step method and its rheological properties are studied. All the samples of nanofluids showed shear thinning behaviour which could be ultimately prove a valuable property during the application of nanofluids in various applications. Contact angle was also measured and found that the all the sample is hydrophilic in nature. Heat transfer/absorbing application of the as-prepared nanofluids was tested and it was observed that the presence of ZnO nanoparticles enhanced the thermal conduction under sonication environment where heat is generated in the solvents during the process. Hwang KS, Jang SP, Choi SUS, (2009) Flow and convective heat transfer characteristics of water-based Al2O3 nanofluids in fully developed laminar flow regime. Int Nat J Heat Mass Transfer 52: 193-9. Lee S, Choi SUS, Li S, Eastman JA (1999) Measuring thermal conductivity of fluids containing oxide nanoparticles. ASME J Heat Transfer 121: 280-9. Eastman JA, Choi SUS, Yu W, Thompson LJ (2001) Anomalously increased effective thermal conductivity of ethylene glycol-based nanofluids containing copper nanoparticles. Appl Phys Lett 78: 718-20. Choi SUS (1995) Enhancing Thermal Conductivity of Fluids with Nanoparticles. ASME FED 231: 99-103. Choi SUS (1999) Nanofluid Technology: Current Status and Future Research Korea – U. S. Technical Conference on Strategic Technologies, Vienna. Choi SUS, Zhang ZG, Yu W, Lockwood FE, Grulke EA (2001) Anomalous Thermal Conductivity Enhancement in Nano Tube Suspensions. Appl Phys Lett 79: 2252-4. Minkowycz WJ, Sparrow EM, Abraham JP (2013) Nanoparticle Heat Transfer and Fluid Flow. CRC Press Taylor & Francis 342. Sharma V, Kumar RN, Thamilrasan K, Vijaybhaskar G, Devra B (2014) Heat reduction from Ic Engine by using Al2O3 nanofluids in engine cooling system, Am J Eng Res 3: 173-7. Ma HB, Wilson C, Borgmeyer B, Park K, Q Yu, et al. (2006) Effect of nanofluid on the heat transport capability in an oscillating heat pipe. Appl Phys Lett 88: 3. Kim SJ, Bang IC, Buongiorno J, Hu LW (2007) Surface wettability change during pool boiling of nanofluids and its effect on critical heat flux. Int J Heat Mass Transfer 50: 4105-16. You SM, Kim JH, Kim KH (2003) Effect of nanoparticles on critical heat flux of water in pool boiling heat transfer. Appl Phys Lett 83: 3374-6. Ekanayake JB, Jenkins N (1996) A Three-Level Advanced Static VAR Compensator. IEEE Transact power systems 11: 540-5. Wong KV, Leon OD (2010) Applications of Nanofluids: Current and Future. Adv Mech Eng 1-11. Kao MJ, Lo CH, Tsung TT, Wu YY, Jwo CS, et al. (2007) Copper-oxide brake nanofluid manufactured using arc-submerged nanoparticle synthesis system. J Alloys Compounds 434-5: 672-4. Kao MJ, Chang H, Wu YY, Tsung TT, Lin HM (2007) Producing aluminum-oxide brake nanofluids using plasma charging system. J Chinese Soc Mech Eng 28: 123-31. Taylor RA, Phelan PE, Otanicar TP, Adrian R, Prasher R (2011) Nanofluid optical property characterization: towards efficient direct absorption solar collectors. Nanoscale Res Lett 6: 225. 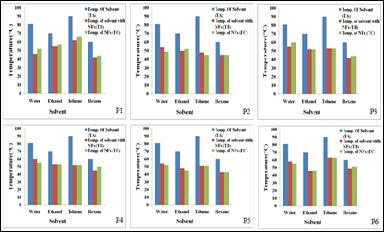 Coumaressin T, Palaniradja K (2014) Performance Analysis of Refrigeration System Using Nano Fluid. Int J Adv Mech Eng 4: 459-70. Lee JH, Hwang KS, Jang SP, Lee BH, Kim JH, et al. (2008) Effective viscosities on thermal conductivities of aqueous nanofluid containing low volume concentrations of Al2O3 nanoparticles. Int J Heat Mass Transf 51: 2651-6. Sundar LS, Sharma KV (2010) Turbulent heat transfer and friction factor of Al2O3 nanofluid in circular tube with twisted tape inserts. Int J Heat Mass Transf 1409-16. Ternik P, Rudolf R, Zunic (2012) Numerical study of heat transfer enhancement of homogeneous water- Au nanofluid under natural convection. Mate Technol 46: 257-26. 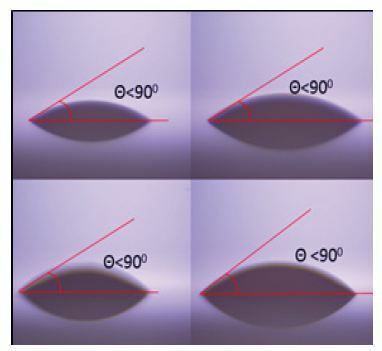 Sourtiji E, Hosseinizadeh SF (2012) Heat transfer augmentation of magneto-hydrodynamics natural convection in L-shaped cavities utilizing nanofluids. Therm Sci 16: 489-501. Heyhata MM, Kowsarya F, Rashidib AM, Momenpoura MH, Amrollahib A (2013) Experimental investigation of laminar convective heat transfer and pressure drop of water-based Al2O3 nanofluids in fully developed flow regime. Exp Therm Fluid Sci 44: 483-9. Pak B C, Cho YI (1998) Hydrodynamic and heat transfer study of dispersed fluids with submicron metallic oxide particles. J Exp Heat Transfer 11: 151-70. Duangthongsuk W, Wongwises S (2010) An experimental study on the heat transfer performance andpressure drop of TiO2-water nanofluids flowing under a turbulent flow regime. Int J Heat Mass Transfer 53: 334. Prasher R, Evans W, Meakin P, Fish J, Phelan P, et al. (2006) Effect of aggregation on thermal conduction in colloidal nanofluids. Appl Phys Lett 89: 143119. Haghshenas FM, Talaie MR, Nasar S(2011) Numerical and experimental investigation of heat transfer of ZnO/Waternanofluid in the concentric tube and plate heat exchangers. Therm Sci 15: 183-94. Lee GJ, Kim CK, Lee MK, Rhee CK, Kim S-W, et al. (2012) Thermal conductivity enhancement of ZnO nanofluid using a one-step physical method. Thermochim Acta 542: 24-7. Fu L, Fu Z (2014) Plectranthus amboinicus leaf extract–assisted biosynthesis of ZnO nanoparticles & their photocatalytic activity. Ceramics Int 41: 2492-6. Fu L, Lai G, Zhang H, Yu A, (2015) One-Pot Synthesis of Multipod ZnO-Carbon Nanotube-Reduced Graphene Oxide Composites with High Performance in Photocatalysis. J nanosci Nanotech15: 4325-31. Xu S, Fu L, Song T, Pham H, Yu A, et al. (2015) Preparation of ZnO flower/reduced graphene oxide composite with enhanced photocatalytic performance, Ceramics Int 41: 4007-13. Patterson A (1939) The Scherrer Formula for X-Ray Particle Size Determination. Phys Rev 56: 978-82. Duan F, Kwek D, Crivoi A (2011) Viscosity affected by nanoparticle aggregation in Al2O3 –water nanofluid. Nanoscale Res Lett 6: 248.